The last regular season college basketball games will tip off one month from Sunday, including a rematch of Houston-Cincinnati, which was the biggest game of the day. The Cougars protected their home court Sunday to become the third team this season to reach the 23-win mark, joining Gonzaga and Nevada. 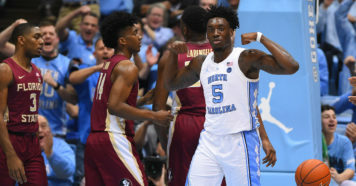 Saturday was a significant day in the season because the NCAA Men’s Basketball Selection Committee announced the top 16 teams in the country, giving fans a taste of what the top four seeds in each region of the 2019 NCAA Tournament bracket would look like if the regular season ended Friday. 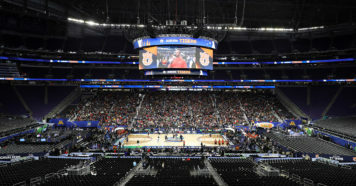 Here’s the latest edition of Stadium’s NCAA Tournament Bracket Scouting, wherein we evaluate college basketball’s top conferences and where their teams stand in their chase for at-large berths to the tournament. We evaluated teams through Sunday afternoon’s games. Here’s how we’re defining each category. Lock = These teams could lose literally every single game from today until Selection Sunday and we think they’d still make the NCAA Tournament. Pencil them in = These teams will probably make the NCAA Tournament but we suggest you use pencil, not pen, when writing their names among the 2019 NCAA Tournament field – for now. If they keep winning, they’ll likely become locks soon. Work to do = Pretty simple definition. These teams need to add wins, both in terms of quantity and quality, to make the NCAA Tournament. The amount of “work to do” varies from school to school. Auto-bid or bust = This is also pretty self-explanatory. These teams better win their conference tournament if they want to make the NCAA Tournament. As the season progresses, teams can move between categories but decisions to put teams in the “Lock” category are final. We believe they’re safe regardless of what happens between the decision and Selection Sunday. Houston and Cincinnati have both cracked the 20-win mark and the Cougars are 23-1 on the season after beating the Bearcats Sunday. Both teams, especially Houston, are incredibly close to being locks. The Cougars were the No. 11 team in the NCAA Men’s Basketball Committee’s Bracket Preview Show Saturday and they could make a run at a No. 2 seed if they continue winning at their current rate. A 23-1 record, regardless of the competition, is flat-out impressive. Plus, the American Athletic Conference leapfrogged the Pac-12 last week in kenpom.com’s conference rankings to be the sixth-best conference nationally, so Houston’s resume is probably better than many college basketball fans realize. Give the Cougars a week and we’ll move them into “lock” status. With one Quadrant 3 game (home versus SMU) and two Quadrant 4 games (on the road against Tulane and East Carolina) left on their schedule, we’re going to hold off from making Houston a lock based on our definition of the category, if only because of SMU in 2014. Just five years ago, the Mustangs, playing in the same conference, were ranked No. 25 in the country, entered Selection Sunday with a 23-9 record and missed the NCAA Tournament. That’s not to say we’re predicting a free fall for Houston in the next few weeks. The Cougars are playing like a legitimate top-10 team and Sunday’s win against Cincinnati was their second-best win of the season. This year’s Cincinnati team has the chance to be most efficient offense during Mick Cronin’s 13-year tenure with the Bearcats. They still fit the profile of a program that has consistently had a top-20 defense that protects the rim and forces contested two-point shots, while crashing the glass aggressively on offense, but junior guard Jarron Cumberland has carried a larger load offensively than any Cincinnati player under Cronin. He has a 30.4 percent usage rate, meaning almost one out of every three possessions ends in Cumberland making a shot, missing a shot that is rebounded by the defense or turning the ball over. That’s more than Sean Kilpatrick’s AP First Team All-American season in 2014 (28.9%) and Lance Stephenson’s first and only season of college in 2010 (26.1%). But Cincinnati hitching the wagon of its offense to Cumberland’s metaphorical horse has paid off. The Bearcats have the most efficient offense in AAC play, scoring 112.1 points per 100 possessions, in large part because of the junior’s 42 percent three-point field goal percentage, six fouls drawn per 40 minutes and 76 percent free throw percentage. Houston and UCF provide the only Quadrant 1 opportunities left on Cincinnati’s schedule. The Bearcats lost their first meeting with the Cougars 65-58 but they’ll get another shot at them on March 10. The Knights remarkably have five remaining Quadrant 1 games in the next month, which feels like a big number for this late in the season in the AAC. However, four of them come on the road. UCF probably needs to win at least two, if not three, to stay on the right side of the bubble. The Knights were among the Last Four In in Stadium’s latest NCAA Tournament projections. Through Saturday, the Owls remain the only team that’s beaten Houston this season. That’s truly a great win but it’s not enough to earn Temple an at-large bid based on its merits alone. The Owls are 1-5 in Quadrant 1 with just two more regular season games in the quadrant – at South Florida and Memphis. At the very least, they probably need to win both games and avoid home losses against SMU, Tulsa and Tulane to enter the NCAA Tournament picture. A road loss at Tulsa Saturday gave the Owls their first Quadrant 2 loss. Temple was the first team left out of Stadium’s latest NCAA Tournament projections. South Florida has more Quadrant 4 losses (1) than Quadrant 1 wins (0), which is a bad place to be in February as an NCAA Tournament hopeful. The Bulls didn’t receive a single vote on Bracket Matrix, through Saturday’s games. If they won the rest of their Quadrant 1 and Quadrant 2 games, they’d be 7-5 in those two quadrants. The Tar Heels very nearly suffered their first Quadrant 2 loss of the season Saturday at home to Miami (FL) but Chris Lykes’ game-winning three-point attempt at the buzzer was off the mark and North Carolina won 88-85 in overtime. North Carolina earned the No. 2 seed in the South region in Saturday’s Bracket Preview Show and with five Quadrant 1 games left in the regular season, a No. 1 seed isn’t out of the question. The Tar Heels still have two games against Duke, plus a home date with Virginia Monday. The Cardinals’ Saturday got off to a great start as they were named the No. 15 team in the country, according to the NCAA Men’s Basketball Selection Committee in the Bracket Preview Show. A road loss to Florida State in overtime quickly put a damper on any good feelings for Louisville fans as Jordan Nwora settled for a three at the end of regulation, which he missed and allowed Florida State to attempt (and miss) a potential game-winning three of its own. The Seminoles outscored the Cardinals 15-10 in overtime, completing the comeback after trailing by 10 with just under nine minutes to play. Louisville could’ve taken a two-game road winning streak into a home game against Duke Tuesday, when the Blue Devils are projected to win 79-73, according to kenpom.com. The Cardinals can still earn a top-four seed but likely only if they can find at least two wins against Duke, Virginia (at home Feb. 23, on the road March 9) and Syracuse (on the road Feb. 20). The Hokies have lost their last two games without senior guard Justin Robinson, including a 59-51 loss at Clemson Saturday. The two-game losing streak has only cemented Virginia Tech as one of the country’s most confusing teams – or at least a team with one of the most confusing resumes. Virginia Tech’s record is impressive, its offense ranks as the 11th-most efficient nationally and six of the nine players in its rotation shoot better than 38 percent from three. There’s a lot to like, especially on paper. But the Hokies’ body of work largely indicates they can’t beat top-30ish teams but they generally win every game in which they’re the clear favorite. They were the team with the highest NET ranking that wasn’t included in Saturday’s Bracket Preview Show and they’re a No. 5 seed in Stadium’s latest NCAA Tournament projections. 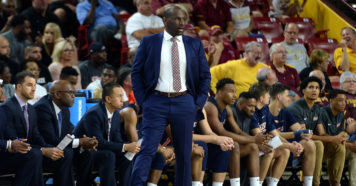 The Seminoles were the beneficiaries of Louisville’s mishandled final possession Saturday and the win improved their Quadrant 1 record to 4-3. All things considered, Florida State has a manageable schedule to finish the regular season. A trip to Chapel Hill on February 23 will be challenging but the Seminoles still get to play Wake Forest twice, Notre Dame and NC State at home and Georgia Tech on the road. Syracuse took care of business at home against Boston College Saturday, which is only notable in the sense that it prevented the Orange from taking a third Quadrant 3 loss. Six of their seven remaining regular season games are in Quadrant 1 and it might only take two or three wins to earn an at-large bid. Syracuse was a No. 9 seed in Stadium’s latest NCAA Tournament projections and it’s probably a safe assumption that the Orange will be a bubble team that falls on the right side of the bubble, yet again. Tuesday’s game between NC State and Syracuse will send the losing team closer to the bubble and Saturday’s game that sends the Wolfpack to Duke offers the chance for NC State to get some breathing room as it builds its at-large resume. The Wolfpack are just 1-6 in Quadrant 1 with only two more Quadrant 1 games left in the regular season. Those come on the road at Duke and Florida State, and it’d be hard to imagine a team with a 1-8 Quadrant 1 record having a significant argument that it should be in the NCAA Tournament. The Tigers finally picked up a Quadrant 1 win as they beat No. 11 Virginia Tech 59-51 on Saturday. Clemson’s resume is a worse version of NC State’s with two fewer wins and one more loss. Seven of their eight remaining games in the regular season fall under Quadrant 1 or Quadrant 2, so the Tigers have no shortage of opportunities, especially at home. They’ll host Florida State, North Carolina and Syracuse and they have winnable road games at Miami (FL), Pitt and Notre Dame. A 20-11 overall record with a 10-8 mark in the ACC should be a reasonable goal if Clemson wants to get an at-large bid to the NCAA Tournament. The Big 12 had two teams – Kansas and Iowa State – among the NCAA Men’s Basketball Selection Committee’s top 16 seeds Saturday. The Jayhawks were No. 10 overall and the Cyclones were No. 13. The conference standings are crowded with five teams within two games of Kansas State in first-place. Eight Big 12 teams in the NCAA Tournament is a realistic possibility and their seeds could range from a No. 2 seed to a No. 11, depending on how the rest of the season plays out. Even though Kansas has essentially been slightly better than a .500 team since losing center Udoka Azubuike (and the team’s roster situation has since regressed as senior Lagerald Vick took a leave of absence from the team and sophomore Marcus Garrett missing time with an ankle injury), Saturday’s Bracket Preview Show showed the impressiveness of Kansas’ overall body of work. The selection committee said that if the season ended Friday, the Jayhawks would be a No. 3 seed and they were just two spots away from a No. 2 seed. But if Kansas continues to lose road games at the alarming pace it has this season, the Jayhawks’ hopes of a top-four seed and another Big 12 regular season title might be out of the question. There was a time last week when Iowa State was projected to win an outright Big 12 regular season title, according to kenpom.com. Then the Cyclones lost at home to TCU 92-83, ending a four-game winning streak. They’ll have a week off before playing at first-place Kansas State next Saturday, which has huge Big 12 regular season championship implications and it’s one of four remaining Quadrant 1 opportunities for Iowa State in the regular season. The Cyclones aren’t far from “lock” status but the question, like most Big 12 teams, is can they find a way to separate themselves from the pack and avoid the cannibalization of the conference? Texas Tech’s 66-54 win over Oklahoma Saturday brought the Red Raiders within one game of .500 in Quadrant 1 and they’re perfect in Quadrants 2 through 4. They’re tied for second in the Big 12 with Iowa State and Kansas at 7-4, 1.5 games behind Kansas State, but they’re projected to share the regular season title with the Wildcats, according to kenpom.com. If Texas Tech can match those computer projections, it’ll earn a top-four seed for the second year in a row. The Wildcats’ wins over Kansas and Baylor not only added two more Quadrant 1 wins to their resume but gave them sole possession of first place in the Big 12 with a 1.5-game lead over the field. Kansas State is 4-2 on the road in Big 12 play (Kansas is 1-5, for comparison) and that’s mutually beneficial to both the Wildcats’ NCAA Tournament resume and Big 12 title hopes with four conference road games remaining. After a three-week stretch of undefeated play in the Big 12, Baylor regressed to the mean, dropping a road game to Texas and a home game to Kansas State. Maybe the Bears aren’t the conference title contender they appeared to be but a top-half finish in the Big 12 and an NCAA Tournament berth should unquestionably be considered a success after starting the season 8-4 and losing Tristan Clark for the year. Baylor is a No. 9 seed in Stadium’s latest NCAA Tournament projections but remaining road games at Texas Tech, Iowa State, Kansas State and Kansas could suggest the Bears are more likely to fall closer to the bubble than improve their projected seeding. The Sooners are in an interesting position where they have a stronger NCAA Tournament resume than TCU and Texas but they’re eighth in the Big 12 standings with a conference record that’s five games below .500. At some point, likely sometime soon, one of those two facts will have to bend to the other. Two Big 12 teams made the NCAA Tournament last season after going 8-10 in conference play, which means that Oklahoma probably needs to go at least 5-2 in its seven remaining games to feel comfortable with its tournament chances. A two-game road trip to Baylor and TCU this week could potentially make or break Oklahoma’s season. Add TCU to the list of NCAA Tournament hopefuls that just picked up its first Quadrant 1 win over the weekend. The Horned Frogs won by nine at No. 17 Iowa State and they have four more Quadrant 1 games at home. TCU was a No. 8 seed in Stadium’s last NCAA Tournament projections and it probably only needs three more wins to make the tournament. The Longhorns have a lot of losses at this point in the season for an NCAA Tournament hopeful and they only have one Quadrant 2 and one Quadrant 3 game left in the regular season – both at home. The rest fall under Quadrant 1. So can Texas avoid a bad loss and win enough games stay on the right side of the bubble? The Longhorns host first-place Kansas State on Tuesday, then Oklahoma State on Saturday. They beat the Wildcats by 20 points on the road earlier in their Big 12 opener and a win over the Cowboys would prevent them from taking another Quadrant 3 loss in the regular season. Villanova is still in sole possession of first place in the Big East even after losing at Marquette Saturday but the Golden Eagles have the better resume. They were the No. 12 team in the Bracket Preview Show and that was before the win over the Wildcats. Luckily, we’ll get a rematch between the Big East’s top two teams thanks to the conference’s round robin format. Depending on how the rest of the season plays out, the Big East could have as few as two NCAA Tournament teams and as many as six. Stadium’s latest NCAA Tournament projections include four Big East teams. The Wildcats received a No. 4 seed in Stadium’s latest NCAA Tournament projections and they’re not far from “lock” status. They probably received consideration for Saturday’s top-16 reveal. But their loss to Marquette dropped them to 3-3 in Quadrant 1 with four Quadrant 1 opportunities left in the regular season. Three of those are on the road and the one home game is against Marquette. Villanova is still projected to win the Big East, according to kenpom.com, but this is a down year for the Wildcats and the conference as a whole, compared to years’ past, and their seeding should reflect that. The Red Storm’s regular season sweep of Marquette is probably the only thing keeping them safely in the NCAA Tournament field – for now. Home losses to DePaul, Georgetown and Providence are head-scratching, to say the least. St. John’s hosts Butler and Villanova this week, the latter of which represents the team’s final Quadrant 1 opportunity of the regular season, and the Johnnies need to at least split those two games. An 0-2 week would drop them to 5-8 in conference play with their remaining schedule being made up of mostly road games and Quadrant 3 home games. The Pirates were the last team in the field of 68 in Stadium’s latest NCAA Tournament projections. This is the first year of the NET rankings so there’s no historical precedent for how low a team can be ranked in the NET and still expect to receive an at-large bid but for the sake of comparison, Syracuse’s No. 72 ranking in the RPI in 2016 is the lowest ranking ever for a team that received an at-large bid. No matter how you break down Seton Hall’s resume and ranking in advanced metrics, the margin for error is small. A road win at Creighton Saturday certainly helps. With five remaining Quadrant 1 games in the regular season, including a return trip to Creighton next Sunday, the Pirates should hope to win at least three of those games. With a road win at Georgetown Saturday, Butler doubled its number of Quadrant 1 victories. That won’t be enough to put the Bulldogs in the projected NCAA Tournament field but it’s a step in the right direction. They were among the First Four Out in Stadium’s latest NCAA Tournament projections. Butler’s only remaining Quadrant 1 games in the regular season are on the road and it’s only remaining home games are in Quadrant 3, so the pressure is on to defend its home court while also winning multiple road games. As weird as it sounds at face value, Butler could finish tied for third in the Big East, like kenpom.com projects, and not make the NCAA Tournament. At two games over .500 overall and three games under .500 in conference play, Creighton’s at-large hopes are shrinking by the day. The Bluejays lost 63-58 at Seton Hall Saturday, leaving a road game at Marquette as their only remaining Quadrant 1 game. If they don’t beat the Golden Eagles, they’ll be 2-10 in Quadrant 1. Their only hope is to win at least six of their seven remaining games and even that may not be enough to reach the right side of the bubble. Overtime losses to Marquette and Villanova could have swung Creighton’s season in a different direction but now it’s trending towards missing the NCAA Tournament for the first time since 2016. Michigan regained its footing atop the Big Ten standings with a road win at Rutgers, which isn’t a given in 2019 as weird as it sounds, and a revenge game against Wisconsin Saturday. The Wolverines and Spartans remain our only locks in the Big Ten. Indiana and Nebraska can still *technically* earn at-large bids but they’re dangerously close to falling into the “Auto-Bid or Bust” category. The Boilermakers are alone in second place thanks to their eight-game winning streak. What a turnaround it’s been for Purdue, which started the season 6-5 but earned the No. 3 seed in the South region in Saturday’s Bracket Preview Show. A No. 2 seed isn’t out of the question considering that Purdue is projected to lose just one of its eight remaining regular season games, according to kenpom.com. That game is on the road at Maryland Tuesday. The Badgers were the final team announced in Saturday’s top-16 reveal. A road win at Michigan, which would’ve completed the regular season sweep of the Wolverines, would’ve cemented Wisconsin’s status as a projected top-four seed but the Badgers may not lose again in the regular season. Wisconsin is favored to win each of its seven remaining regular season games, according to kenpom.com. Barring a late-season slide, the Badgers are on pace to earn their highest seed since they were a No. 1 seed in the 2015 NCAA Tournament. The Hawkeyes aren’t far from “lock” status after wins against Michigan and Indiana in February. The victory over the Wolverines gives them a marquee win, in addition to their nicely-aged victory over Iowa State in December. A top-four finish in the Big Ten might be out of reach but Iowa can still aspire for a top-four seed in the NCAA Tournament. They have five Quadrant 1 games left, including two against Michigan (the first of which is on the road Saturday) and a home game against Purdue Tuesday. The Buckeyes have righted the ship after losing five in a row in January. Sure, the recent competition has mostly been against the worst teams in the conference – Nebraska (13th in the Big Ten), Rutgers (T-10th), Penn State (14th) and Indiana (T-10th) – but their latest win over the Hoosiers Sunday was a Quadrant 1 victory. They have six more Quadrant 1 opportunities and if they can split their eight remaining games, a 20-11 overall record (10-10 Big Ten) entering the conference tournament would be enough to safely make the NCAA Tournament. The Golden Gophers are in danger of missing the NCAA Tournament for the second season in a row and the fifth time in six seasons under Richard Pitino. He fell under the “Likely Another Year” category in Stadium’s latest Coaches on the Hot Seat update. A three-game losing streak, albeit to three of the top five teams in the Big Ten, has dropped Minnesota to 6-7 in conference play and eighth place in the standings. The Gophers were a No. 8 seed in Stadium’s latest NCAA Tournament projections but kenpom.com projects them to be underdogs in six of their seven remaining games, which means Minnesota is likely to trend closer to the bubble in the weeks to come. The Hoosiers’ latest loss to the Buckeyes might be the one that finally pushes them on the wrong side of the bubble. It felt like the point at which its disastrous current state of play and outlook finally outweighed the resume goodwill it had built up in the first two months of the season. A 12-2 start to the season had buoyed their NCAA Tournament resume through just a brutal start to 2019 but Indiana has now lost nine of its last 10 games and it’s projected to lose its next six, according to kenpom.com. Indiana was the second-to-last team in the field in Stadium’s latest NCAA Tournament projections and it probably needs to go at least 5-2 in its final seven games to contend for an at-large bid. Poor Nebraska. The Huskers have lost seven in a row and their last two defeats were by a combined 34 points against Maryland and Purdue. Mathematically, Nebraska hasn’t been eliminated from consideration for an at-large bid. But it’s not far off. The Huskers host Minnesota and Northwestern this week, which are their best – and perhaps only – hopes of winning again in the regular season. A three-game stretch against Purdue, Michigan and Michigan State might as well be NCAA Tournament resume gold but a team that hasn’t won since January 14 inspires little confidence that it can capitalize on such an opportunity. Nebraska might be a week away from dropping to the “auto-bid or bust” category. If Washington wins the Pac-12 Tournament, there’s a very real chance that the Pac-12 is a one-bid conference this season. Despite having a three-game lead in the Pac-12 and owning 19 wins this season, Washington is still in the “Work To Do” category and just a No. 8 seed in Stadium’s latest NCAA Tournament projections. The Huskies don’t have a single Quadrant 1 game left in the regular season, only two Quadrant 2 opportunities and five games that fall under Quadrant 3 or Quadrant 4. The latter group of games are “must-win” games only because losing any one of them, let alone multiple, would be terrible for their resume. They suffered their first conference loss Saturday at Arizona State 75-63. Ironically, Arizona State’s win over Washington Saturday night dropped the Huskies’ NET ranking outside of the top 30, which means the win falls under Quadrant 2 on Sunday, even though it was a Quadrant 1 game at tip-off. So, the Pac-12 is so bad that when the best team in the conference loses on the road to the arguably second-best team in the conference, the best team in the Pac-12’s NET ranking is damaged to the point that the value of the win is diminished for the other team. If that doesn’t sum up the Pac-12’s season, then I don’t know what does. Bill Walton took a bite out of a cupcake that had a lit candle on top of it on national TV Saturday night and that was the most entertaining moment in the Pac-12 this season. Anyway, Arizona State could actually finish the regular season with a 6-1 record in Quadrant 1 if Washington can finish in the top 30 of the NET rankings and if the Sun Devils beat Arizona and Oregon on the road, while the Wildcats and Ducks finish in the top 75 of the NET. Arizona State was a No. 10 seed in Stadium’s latest NCAA Tournament projections. Saturday’s game between No. 1 Tennessee and No. 5 Kentucky in Lexington will be on the short list of the best regular season games this season. It could be a rare time in which the No. 1 team in the country is an underdog at tip-off. We didn’t make any changes from last week’s categorical breakdown in the SEC with the Volunteers and Wildcats as the only locks and LSU as the only team in the “Pencil Them In” category. The Tigers improved to 5-2 in Quadrant 1 with an 83-78 win over Auburn Saturday and they’re now knocking on the door of “lock” status. LSU is tied with Kentucky for second place in the SEC with a 9-1 conference record and the Tigers will get a shot at the Wildcats on the road on Tuesday. LSU plays Tennessee once in the regular season – at home on February 23. The Bulldogs missed out on two huge opportunities last week at home, falling to LSU 92-88 in overtime and to Kentucky 71-67. They still have a 6-4 record in Quadrant 1 games but either win would’ve been their best of the season. Now, Mississippi State’s three remaining Quadrant 1 games are all on the road – at Arkansas, Auburn and Tennessee – and three of their four remaining home games are in Quadrant 3. It seems likely that Mississippi State will earn a seed in the range from a No. 6 seed to a No. 8 seed. Another result of Washington’s aforementioned drop outside of the top 30 of the NET rankings is that Auburn’s best win of the season now falls under Quadrant 2 and leaves the Tigers without a Quadrant 1 win on February 10. Advanced metrics say Auburn is good. Just look at its No. 14 ranking on kenpom.com or its No. 20 NET ranking, but its resume is severely lacking. The Tigers missed out on a quality road win at LSU Saturday. They have four Quadrant 1 opportunities left but two of those are against Tennessee and Kentucky so the Tigers will likely be underdogs in both. The Rebels went 2-0 last week against Texas A&M and Georgia, which should be expected of an NCAA Tournament hopeful, and they were a No. 9 seed in Stadium’s latest NCAA Tournament projections. Ole Miss is projected to split its remaining eight games, according to kenpom.com, which should be enough to secure a top-half finish in the SEC and an at-large berth. The Crimson Tide were a No. 10 seed in Stadium’s latest NCAA Tournament projections and a No. 11 seed on Bracket Matrix, so they’re just on the right side of the bubble. Alabama’s win over Kentucky continues to look better by the week and it has two more Quadrant 1 games at home against LSU and Auburn in early March. Similarly to Ole Miss, if Alabama can reach the 10-8 mark in SEC play, it should feel good about its NCAA Tournament chances. The Gators need wins, badly, in terms of both quantity and quality. They’re just one game over .500 overall, two games under .500 in SEC play and now 1-9 in Quadrant 1 after Saturday’s loss to Tennessee. Four of Florida’s five remaining Quadrant 1/2 games are on the road so it’s only a matter of time until the Gators move to the “Auto-Bid or Bust” category. The Razorbacks’ record is better than their resume. They lost at South Carolina Saturday, bringing their Quadrant 2 record to 2-2, and they have just as many losses in Quadrant 3. A .500 finish in SEC play, like kenpom.com projects, may not be enough for Arkansas to get on the right side of the bubble. The Razorbacks weren’t even in the Next Four Out in Stadium’s latest NCAA Tournament projections.